Traveling salesmen and pharmacies packed with colorful bottles claimed to have all the medical cures for what ailed you in the 19th century, although the contents of their remedies were more likely to be opiates or snake oil than any scientifically sound healing. The era of patent medicine—which stretched from the 17th into the 20th century and was especially prolific in the United States and England—was a response to the shortcomings of medicine at the time, which often relied on questionable treatments like bloodletting and purging. The patent in the name didn’t refer to any government approval, but proprietary concoctions marketed with extreme promises and flamboyant showmanship. Brimming with alcohol, opium, cocaine, and other unregulated substances, it’s no surprise their users felt like the pills and tonics were doing something, even if they became addictive or, worse, fatal. Federal regulations eventually cut off this free trade of drugs, as did exposés like a 1906 issue of Collier’s that depicted the industry as “death’s laboratory” with an illustration of patent medicine being pumped out of a skull flanked by moneybags. Nevertheless, you can still find popular treatments like Sloan’s Liniment and Lydia Pinkham’s Vegetable Compound nestled in the drugstore, survivors from the golden age of quackery. Opiates were readily available as painkillers, and also marketed for all sorts of woes, even the treatment of children’s coughs and colds or just to keep fussy babies quiet. McMunn's Elixir of Opium [PDF] was developed in the 1830s by John B. McMunn in New York, who mixed it with alcohol and advertised the result for "nervous irritability" as well as rabies and tetanus. Meanwhile shoemaker Perry Davis [PDF] manufactured his opium-based cures for cholera and other infectious diseases, the benign bottle boasting the medicine was "purely vegetable" and "no family should be without it." The consumption of blood is not itself an oddity, and became part of the tonic offerings in patent medicine through manufacturers like the Bovinine Company in Chicago. A truly unsettling 1890 ad for Bovinine shows a woman with her eyes closed, a small glass of red liquid beside her, and the words: "Look on me in my lassitude reclining / My nerveless body languid, pale and lean; / Now hold me up to where the light is shining / And mark the magic power of BOVININE." When the postcard is held up to a light, suddenly her eyes open and a ghostly steer appears outside the window with the words “My life was saved by Bovinine.” And the drug probably was quite eye opening, being a tantalizing and alcoholic mix of beef blood, glycerine, and sodium chloride (salt). Famously, Coca-Cola was named for one of its more shocking 1880s ingredients: coca leaves. It's unclear exactly how heavy the cocaine dose was in the soda, then marketed as a “brain tonic,” and it was among many medicinals that included coca leaves in their brews. The drug was legal until 1914. In 1890, you could pick up Allen's Cocaine Tablets for your hay fever, "throat troubles," or headache at 50 cents a box, and in the early 1900s both Ernest Shackleton and Robert F. Scott carried "Forced March" cocaine and caffeine pills for endurance on their Antarctic expeditions. Being an Englishman from Yorkshire didn’t stop William Henry Hartley from adopting an eccentric Buffalo Bill-like persona to sell his Sequah's Prairie Flower and Sequah's Oil, cures supposedly based on Native American traditions. The evocation of the exotic and indigenous in advertising was prominent in patent medicine, although almost always completely fictional. Hartley, who operated his Sequah Medicine Company in the UK between 1887 and 1890, was one of the more bombastic personas in this appropriation, with a Wild West-styled circus that rolled into town. The show would start after dark, with teeth pulled to the music of a brass band (playing loud, to drown out noises of pain) to draw in the crowd. On more atmospheric evenings, there were even séances. All this pomp was aimed at selling Hartley’s Prairie Flower and “Indian oil” cures for a variety of ailments, like stomach issues and liver disorders. Later the ingredients were revealed to be organic material from the East Indies and cheap fish oil cut with turpentine. Petroleum jelly is still a common part of our medicine cabinets, but in the 19th century oil was marketed as a treatment for everything from ulcers to blindness. Samuel Kier in Pennsylvania was trying to use up the incredible amount of oil created by his salt wells, and in 1852 launched his "Kier’s Petroleum, or Rock Oil" as a 50-cent cure-all. It likely was potent, as he later distilled the same petroleum and successfully sold it as a lighter fluid. Cannabis appeared in Western medicine through William O'Shaughnessy's studies with the British East India Company in the 1830s; he saw it as an effective prescription for pain. Soon patent medicine was getting in on the action, selling it as a cure-all. For instance, Piso's Tablets were advertised for "women's ailments," and contained a punchy mix of cannabis and chloroform. "Tomato Pills Cure Your Ills" crowed the ads for Dr. Miles Compound Extract of Tomato. Before ketchup took off as a condiment, people were ingesting tomato pills for remedies for all sorts of illness. Others like John Cook Bennett, a physician in Ohio, also proclaimed the benefits of tomatoes to treat stomach issues like diarrhea and indigestion. It's likely the lycopene in the tomatoes actually did some good, and eventually the vegetable that was once nicknamed the "poison apple" in the 18th century was on its way to 20th-century popularity. Arsenic was long used in traditional Chinese medicine, as well as a Victorian cosmetic. 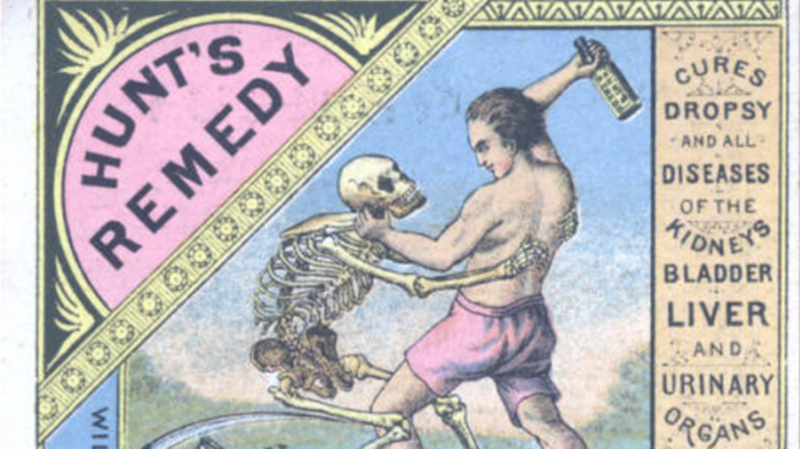 Patent medicines regularly incorporated the poison, with or without the user’s knowledge. Mercury and lead were also sometimes present in the more toxic remedies, and both arsenic and mercury would be used to treat syphilis. Pharmacy offerings, like Fowler’s Solution, proposed arsenic as a tonic and treatment for ailments like leukemia and malaria, while Donovan's Solution was advertised for skin diseases, and "Tabloid" had arsenic mixed with iron for heart conditions. Hair tonics were big business for patent medicine purveyors, promising to stop grayness, dandruff, and regrow lost locks. Ingredients included lead, borax, cochineal (smashed red insects), silver nitrate, arsenic, and heavy doses of alcohol. Not surprisingly, these tonics were popular during Prohibition in the United States, packing the same boozy bang as a shot of whiskey. And having about the same effect on hair loss. Radioactive solutions emerged in the early 20th century after radioactive decay was identified in 1896. One of the more infamous of these was Radithor, a patent medicine with distilled radium, made by self-proclaimed doctor William Bailey, who had previously sold strychnine as an aphrodisiac. Socialite and industrialist Eben Byers took Radithor following an arm injury in 1927, and continued consuming it through the 1930s, when he slowly died a grotesque death involving snapping bones and lost teeth. Byers's demise prompted an investigation into Radithor, and ultimately its removal from pharmacies, although poor Byers was buried in a lead coffin due to the contained radiation in his body. As a 1932 Wall Street Journal article quipped: "The Radium Water Worked Fine Until His Jaw Came Off." Victorians were fanatics for pallid skin, and freckle removers were marketed to this obsession. Some of these products included mercury, such as Dr. Berry's Freckle Ointment made in Chicago. Amelia Earhart was known to detest her freckles, so when a pot of the poisonous cream was found on the Pacific island of Nikumaroro, many believed it was a sign of the lost aviator's crash. If a hot bath with the right powder could reduce obesity, humans would have evolved gills by now. Sadly, remedies like "Healthone-Obesity Bath Powder" were all quackery. The pitch was that soaking with the powder a couple times a day would take the extra pounds away. Examining the powder revealed it was mostly perfumed sodium carbonate, which probably did make for a mineral-feeling soak. Swamp root doesn’t sound like something you’d want to ingest, yet it was wildly popular as an advertised ingredient in patent medicine. Products like Dr. Kilmer's Swamp Root were said to "promote the flow of urine,” as well as treat invented illnesses like "internal slime fever" [PDF]. Whatever organic material it contained, like so many patent medicines, it seems the most active ingredient was alcohol. Like Coca-Cola, Dr Pepper has its roots in patent medicine. The drink was created in 1885 by a Texas pharmacist named Charles Alderton, and sold as a "brain tonic." The period after "Dr" was reportedly later removed during its 20th-century mass marketing in order to not suggest any medicinal properties. Dr. Williams' Pink Pills for Pale People were among the treatments aimed at anemia, with the alliteration intended to catch the attention of customers—particularly British colonists. Made of iron oxide and magnesium sulfate, they certainly weren’t among the most dangerous of patent medicines, but they far from fulfilled their promise of curing everything from paralysis to cholera. George Fulford, who sold the remedy around the world, is often remembered for quite a different legacy. His vehicle was hit by a streetcar in 1905, and at the age of 53 he became Canada's first automobile death.